Reverend Monsignor Anthony (Fr. Tony) M. Tocco is Pastor of St. Hugo of the Hills Parish in Bloomfield Hills, where he has served since July, 1985. Msgr. Tocco is an alumnus of both Sacred Heart Seminary and St. John’s Provincial Seminary, and holds a Masters of Arts degree in Guidance and Counseling from the University of Detroit and a Master of Divinity from St. John’s Provincial Seminary. Msgr. 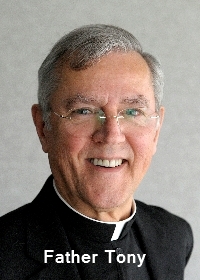 Tocco is a native Detroiter, the twelfth of thirteen children, and was ordained a priest of the Archdiocese of Detroit on June 5, 1965. On May 14, 1990, he was elevated to the Honorary Prelature of Monsignor by Blessed Pope John Paul II. Additionally, he is a founding member of the Great Lakes Chamber Music Festival and member of the College of Consultors of the Archdiocese of Detroit.